07 JANUARY 2013, NATIONWIDE, U.S.A.
GoFightForeclosure.com today announced that they urge homeowners to do a QWR “Qualified Written Request”. Citing that the Bank Of America settlement to pay Fannie Mae billions is a clear indication that improper mortgage securitization exists when it comes to loan servicing. According to Kyle Ransom, creator of the Go Fight Foreclosure System this settlement is a step forward for the foreclosure crisis. Ransom a former mortgage broker with over 16 years of experience says that with the Bank Of America and Fannie Mae settlement will be an increase in foreclosure filings. Revealing for Fannie Mae their problem has always been that they could never really prove how they were the holder and owner of the loans in due course purchased from Countrywide. He discloses this was why he also created the QWR Attack system. 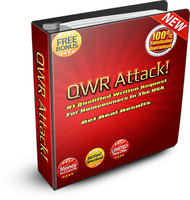 The purpose of the QWR Attack system is to uncover important disclosure details about the mortgage loan. A resource strategy he says challenges the foreclosing party authority to foreclose. This also works as a negotiation strategy for loan modification settlements to reduce principal balances and lower interest rates that would have otherwise been denied through traditional loan modification steps. “Banks should have worked out deals with the homeowners long before now. The servicers could never validate the debts for how Fannie Mae was the holder in due course of the promissory notes and security instruments,” stated Kyle Ransom. Continuing Ransom stresses this is also the same issue for Freddie Mac and Ginne Mae and for the servicing parties. He further expresses that it is now up to the homeowner to educate themselves on wrongful foreclosure to stop the rush of foreclosures coming in the future. To learn more about the Go Fight Foreclosure System 2.0 please visit http://GoFightForeclosure.com .